George is 15 months and looking for a home after his owner abandoned him, unfortunately George hasnt had the best start in life and is a very fearful boy. He isnt used to the normal sights and sounds that most socialised dogs are. 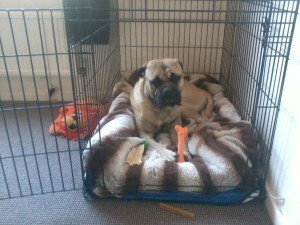 George’s foster mum and Dad Sue and Dave are working so very hard to build George’s confidence. He still has a way to go though. George needs an adult only home preferably with atleast one female as he bonds better with women. He needs a quiet home where he can relax without having to worry about too much noise etc. He also needs a home that is willing to help him overcome his anxieties and turn him into the dog we know he can be. At home he is loving and gentle, extremely loyal and well mannered. George is good with other dogs but will only be homed with a female dog.